While most merchant processors are still behind on EMV acceptance, Choice is proud to introduce one of the first mobile EMV acceptance technology in the United States. You can accept EMV credit cards and PIN debit cards anywhere, using your iPhone or Android device. Now you can accept credit cards on-the-go with confidence, knowing you’re covered with EMV certified transactions. If you are processing less than $3,000 per month, Choice has developed a merchant account plan which will suite your needs for credit card processing. The low monthly fee of just $10* provides flexibility and efficient merchant services. The monthly fee includes our 24/7 live customer service, statement fee, technical support and even a full online virtual terminal and advanced features that will take your business to the next level. If you process over $3,000 per month and has more than one sales location or just need an extra terminal at your current location, this plan is made for you. Enjoy lower rates, no commitment, on top of that we now added online payments to this program which lets you process credit cards from any computer at no extra charge! Ready to take your processing to the next level? Start accepting chip cards on-the-go with EMV mobile payments technology. Our mobile payment processing technology is the most advanced and secured on the market. With an EMV certified payment gateway you can feel at ease as your transactions are certified to process with chip cards.On top of accepting EMV credit cards you can now process PIN debit cards with your iPhone or Android device. Using one of our encrypted Bluetooth credit card readers you can process PIN, EMV, NFC and MSR transactions wherever you go. Accepting PIN debit cards on a mobile device is relatively new in the US. The greatest advantage of accepting PIN debits is lower processing fees, less fraud and greater merchant protection for chargebacks and overall less liability. EMV Chip helps fighting fraud. Counterfeit cards are now fought by the EMV chip. Lost or Stolen cards are fought by the use of PIN and signatures, while card-not-present transactions are handled by encryption and tokenization. What is EMV, MSR, NFC & PIN? EMV – Stands for “EuroPay, MasterCard and Visa” and typically is referred to credit cards that have a chip. MSR – Stands for “Magnetic Stripe Reader” and usually refers to credit cards that you can only swipe. NFC – Stands for “Near Field Communication” and relates to a technology that can be used to process payments using two devices (like your smartphone and a credit card terminal). PIN – Stands for “Personal Identification Number” and currently in the payment processing industry is referred to the code a customer has to use with a debit card. 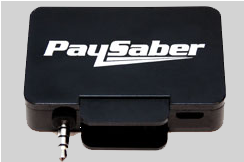 The PaySaber Jack is a compact magnetic stripe reader that allows merchants to accept payments wherever they go. It is the first PaySaber designed to work with both Apple and Android mobile devices. 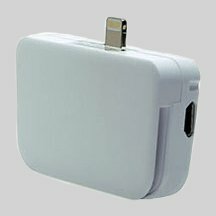 Works with any iPhone®, iPad®, or iPod Touch®, as well as with most Android® smart phones and tablets.